All electrical wiring deteriorates with time, so it’s essential to test all fixed wires regularly to ensure complete compliance with the Electricity at Work Regulations. This not only protects your colleagues from the risk of accident and injury, but gives you complete peace of mind. Our fully accredited electricians have the knowledge and experience to perform both visual and electrical tests to ensure the safest and most secure practices possible. Our industry-qualified engineers search for any potentially dangerous defects within the system that could otherwise lead to fire or injury. 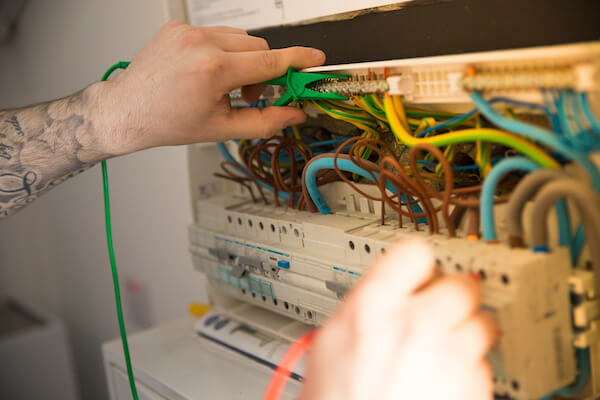 With our electricians experience, we offer fast and efficient repairs and can identify potential future problems, preventing them from developing any further. The comprehensive fixed electrical testing service we offer keeps you fully compliant without disrupting your workplace any more than is strictly necessary. A few years ago fixed electrical testing generally took place every five years. However, newer guidance and regulations stated that electrical installations shouldn’t be left without any maintenance for periods of five years between inspections. Because of this and the fact that most businesses don’t have any staff classed as qualified in electrical inspections, there is now a requirement for annual visual inspections, that build to a full test inspection test over a five year period. As with PAT testing you should take a cautious approach on how often you carry out inspections on equipment and fuse boards. If the general public or employees are going to be within key areas then you should carry out inspections more regularly. Contact us today to take care of all your fixed electrical testing.